In 1975 he enters the Paris Opera Ballet school. In 1979 upon the graduation he joines the company as a member of the Corps de Ballet. 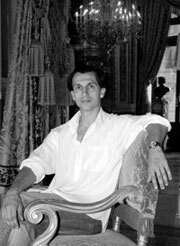 In 1983 he is chosen by Rudolf Nureev to interpret the role of Franz in Coppelia, after this he is engaged in the repertoire and performs other important parts in the ballets: Midsummer Night Dreem (John Neumeier), Divertimento № 15 (George Balanchine), Giselle (version Mary Skeaping), Rom_o and Juliette, Washington Square, Swan Lake (Noureev), Napoli (August Bournonville). After the performance of the role of Prince in Swan Lake (version Bourmeister) he is nominated Danseuse  Etoile. His repertoire includes the leading roles in ballets: La Sylphide (Lacotte's version of Taglioni), Giselle, Paquita (Petipa), Swan Lake (versions Bourmeister and Noureev), P_trouchka, Le Spectre de la rose (Fokin), Les Pr_sages (Massine), Apollon, The Cristal Palace, Agon, Th_me & Variations, Symphonie en Trois Mouvements, Violin Concerto, Sonatine (Balanchine), Suite in White (Lifar), Etudes (Lander), The Lilac Garden, Dark Elegies and other roles in the ballets by Robbins, Petit, B_jart, MacMillan, Rudi van Dantzig, Noureev, Kyli_n, Nils Christe, Forsythe, Dominique Bagouet, Jos_ Montalvo, James Kudelka, Angelin Preljocaj. In 1998 he received Officier des Arts et Lettres. He tours with Paris Opera in Spain, Argentina, Brasil, Japan, Hong Kong, the USA, Switzerland, China, Milan, at the Dance Biennale in Lyon. Lauran Hilaire performed as a guest artist with other ballet companies of the world (Tokyo Ballet, Berlin Ballet, Royal Danish Ballet, New Zealand Ballet, Vienna Opera Ballet, the National Ballet of Canada, Ballet La Scala (Milan), American Ballet Theatre in New York and Chicago, London Royal Theatre, B_jart Ballet Lausanne. On June, 30, 2002, he performed the role of the Chairman of the Jury in the ballet Le Concours (Maurice B_jart).